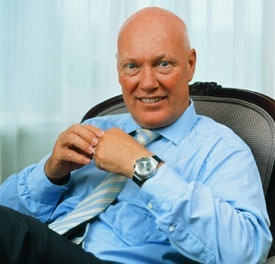 Hublot CEO Jean-Claude Biver was recently featured in the very interesting article “Face Value: Salesman of the Irrational” in The Economist. And in addition to a CV that includes such famous accomplishments as successfully shepherding the rebirth and resurrection of brands like Blancpain and Omega, Jean-Claude Biver is reported to make some really, really excellent cheese too. What a guy. The article in The Economist is especially interesting for several reasons, but perhaps one of the best (unless you really like cheese) is the way in which it describes Biver and Hublot’s success using a strategy of deliberately constraining deliveries to enhance continued demand. Collectors have long maligned what has been termed the “Daytona Effect” after the manner in which certain models of the otherwise perhaps unremarkable steel Rolex became highly sought-after and hard to find when Rolex similarly constrained supply. Though a current, regular production model the Daytona was nearly impossible to find, often requiring long waits on waiting lists and paying premiums well above (sometimes even 2x) MSRP — if you could even find them. And this was even achieved before Rolex began using their own in-house chrono caliber. Luxury brand management is a complex animal at times, often rooted more in marketing than in pure economics. It might seem counter-intuitive on the face, but limiting supply enough to keep us interested seems to have proven to be a workable strategy. By doing so brands can create the illusion of exclusivity, something people arguably want when buying something as personal and sentimental as a watch. A happy consequence for Hublot of the restricted supply strategy was that the brand was in effect somewhat insulated from the economic downturn. As Authorized Dealers had little stock on hand to begin with, they couldn’t simply reduce orders and rely on existing stock to meet customer demand. Instead, the orders from ADs continued in a more or less stable manner, with Hublot only seeing sales down 15% on the year versus the 30% or so reduction facing the wider industry. And perhaps more importantly for long-term brand image is the fact that ADs have not resorted to higher discounting to move existing stocks out the door. By contrast, even the venerable Rolex even had resort to buying back unsold stock from ADs in certian markets to head off over-discounting or wholesale dumping on the gray market by struggling retailers, a very unusual step necessary to prevent tarnishing of the brand image and prevent gray marketers from competing with its authorized distribution network.